Home - Cornet Technology Inc.
Mission-Critical Operations Need Unrivaled C4ISR Solutions! Cornet Technology is an innovator in C4ISR Solutions. With 30 years of expertise, we have built our integrity on the valued trust of our customer. Delivering unmatched tactical communications in audio, video, voice, and data to our military and first responders worldwide. Our mission is to provide our customers the very best in military communication equipment, quality customer service, and technical support. Because we’re committed to the responsibility in safeguarding our service men and woman in the most hostile environments. Cornet can integrate, deploy, and secure large-scale data sharing. Therefore, giving impenetrable point to point communications from command headquarters to reconnaissance patrol units (4G LTE Manpack). As a result, it guarantees the utmost in situation awareness, security, and operational capabilities. 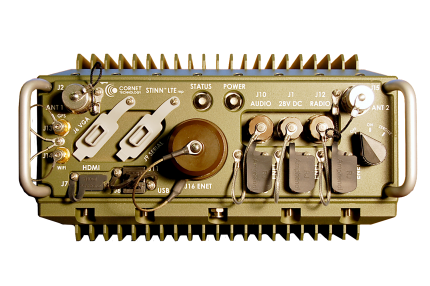 Above all, Cornet designs, engineers, tests, and builds the world’s best communications equipment. Our products and services are proudly securing mission-critical operations for SOCOM, MARSOC, USASOC, NAVSPECWARCOM, AFSOC, JSOC, SMU, CUSTOMS, and BORDER PATROL. Let’s talk about your communication requirements: C4ISR Solutions, Tactical Voice Terminals, IP/ISDN/Analog Voice Terminals, Circuit To Packet Gateway, Legacy To IP/MPLS Communication Terminals, 4G LTE Manpack Base Station, Deployable Communication Solutions, Vehicle Communication, Mission Computers, Video Encoders, and other such Customized COTS Solutions. IPGate®-MG50 circuit to IP/MPLS gateway, provides the flexibility to transition mission critical TDM services over packet based (IP/MPLS or VLAN) networks. IPGate-MG50 uses hot-swappable interface cards, and supports T1/E1, DS3/E3, RS-232, RS-422, RS-449, RS-530, V.35, X.21, analog voice (E&M & FXS/FXO), plain and secure radio-over-IP, wideband, narrowband, and Condition Di-phase (CDI). IPGate interface with customer service rates from 50 bps up to 52 Mbps and can transport over service over a 1/10 GE IP/MPLS or VLAN copper or fiber interface. Smaller, lighter, and easier to install. Smaller, lighter, easier to install, operate, and maintain, the STINN LTEmp is a quantum leap forward in 4G LTE manpack technology (eNodeB and EPC) for dismounted and vehicle operations. STINN LTEmp overcomes the challenges of connecting operators and first responders to an IP network, anytime and anywhere in the world to provide critical voice, video, data, and Position Location Information (PLI) services for improved Command, Control (C2) and Situational Awareness (SA). The IPGate-HD32, reliably transports legacy Time Division Multiplexing (TDM) and other circuit-based applications (such as radio over IP- RoIP) across converged IP networks to deliver the cost, efficiency, and reliability benefits of IP technology migration. The IPGate NED, a network edge IP gateway, is a compact member of the IPGate product family designed for use in network edge applications. Designed for use by military, homeland security, and first responders, the TVCS OMNI allows all users to communicate irrespective of the types of devices and physical locations of the participants. It allows inter-working between disparate input radio networks. For close to three decades Cornet Technology, Inc. (CTI) has taken a leadership position in the design, engineering, and manufacturing of C4ISR solutions that span data, video, and voice communications applications for a range of Government and Prime Contractor clients. As new video capabilities emerge, defense agencies and first responders, globally, increasingly rely on video technology for an ever growing range of activities. The network evolution to all IP is on the fast track. Even with networks that maintain their legacy formats for a variety of reasons there is a push to take advantage of the benefits of IP networks. Building on our tech control expertise Cornet Technology has designed a family of products known as IPGate® that give governments worldwide the ability to interface their legacy networks with IP networks. Springfield, Virginia — July 23, 2017. Cornet Technology, Inc. is pleased to announce that its IA-hardened software based IP Voice Recorder, SofCor-200, has completed successful JITC testing along with its TVCS Omni voice conferencing system. SofCor-200 (https://cornet.com/product/sofcor-200-voice-recorder/) is a Java based application that resides on a hardened Red Hat Enterprise Linux server. SofCor-200 records IP audio streams from the associated voice switch supporting a variety of audio ports such as FXS, FXO, T1/E1, radio and SIP/VoIP. Privacy of recorded call transcripts is ensured through data at rest encryption. SofCor-200 is ready to support a variety of voice systems based on its audio interface specifications. Cornet’s TVCS Omni (https://cornet.com/product/tvcs-omni-2/) voice conferencing system is the first to support SofCor-200. SofCor-200 provides GUI-driven client software to manage, configure and carry out audio playback functions.